Motion control start-up Leap Motion has announced that it is finally to ship its long-awaited eponymous gesture-sensor, following a delay to the originally-scheduled 2012 launch date. The company launched four years ago after its founders got frustrated with the experience of attempting to create three-dimensional models on a computer using a standard keyboard and mouse. 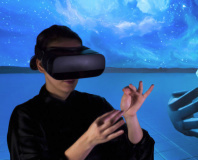 Its promise of natural, intuitive gesture-based control through 3D space met with approval from venture capitalists, and with $12.75 million in Series A funding under its belt it started to develop its first product in 2012, the Leap Motion Controller. Originally scheduled to release before the end of 2012, the Leap Motion Controller has suffered a few schedule slips along the way - but the company has also picked up commercial support, with Asus promising to bundle the Leap Motion with selected PCs and Best Buy agreeing US exclusivity for the retail pack. An additional $30 million in Series B funding, announced in January this year, appears to have been the final push the company needed to get the work finished and the device is due to hit shelves in May. While the Leap Motion Controller will be exclusive to Best Buy stores in the US, the company has been running an international pre-order system through its website for much of the last year. For $79.99, the company promises a compact motion-sensing dongle that connects to any PC running Windows 7, Windows 8, OS X 10.7 or OS X 10.8 and provides full three-dimensional control of the computer. The company's original desire to make 3D modelling easier will be achieved, the company claims, with the release of plug-ins for Autodesk software - with other companies expected to follow - while gamers will be able to wave their fingers madly in an optimised version of ZeptoLab's popular Cut the Rope casual game. With Leap Motion claiming impressive accuracy for its sensor system - with the small Apple-inspired device being able to track the movement of both hands and all ten figures with an accuracy of 1/100th of a millimetre at up to 290 frames per second - a retail launch will either deliver on the company's promises to its thousands of pre-order customers - or destroy it entirely. Sadly, Leap Motion has yet to confirm retail availability in the UK - although those who are anxious to be among the first to wave their hands at their computer can pick up a unit direct from the company's website. If you need a bit more convincing, check out the company's sales pitch below. Will open-source the design next week. Lower power, wider field of view. 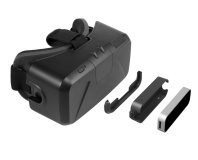 Bring your fingers into your VR world.